VK-2 has the capability for Frequency Modulation, Ring Modulation, and Amplitude Modulation. Check out these quick and easy steps to setting it up. 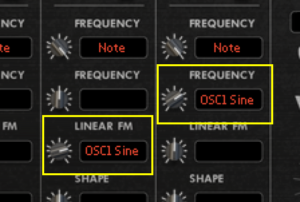 The type of FM you are used to with FM synths is Linear FM. There is a dedicated modulation parameter display for Linear FM on each of the three oscillators. You can simply choose a source there, typically it would be a sine wave from another oscillator. You can also have non-linear FM, by choosing an audio rate source as a Frequency modulator. This type of FM does not stay consistent across the keyboard, but is useful for experimental sounds. In the picture, you can see both types of FM. Amplitude Modulation is the result of changing the volume of a signal at an audio rate. Unlike many synths, all of the modulation targets on VK-2 offer audio rate modulation. You can use the amp control target to create amplitude modulation. 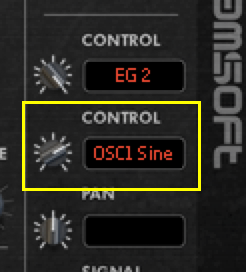 For example, you can select an oscillator waveform in the display. Ring Modulation is like Amplitude Modulation. The volume of a signal is changing rapidly. The only difference between Ring Modulation and Amplitude Modulation is that the amplitude changes from completely positive to completely negative, instead of just to zero. So, in Ring Modulation the signal will be inverted some of the time. For this, we get to use Mod Bus 1, the mod busses have special behavior that allows for Ring Modulation when the scale is an audio oscillator. Simply set the source in the Source display, and the modulator in the Scale display. Then choose Mod Bus 1 as the audio source in the Mixer. Now you can set up the basic types of audio rate modulation, have fun exploring these settings!